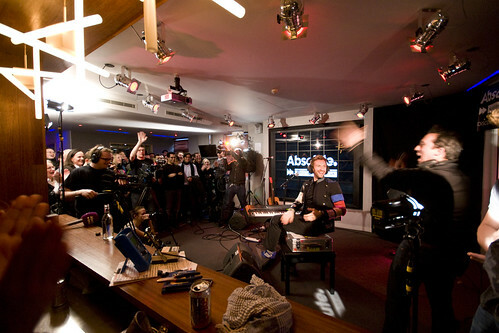 Lots of live streaming (now over obviously) of Chris Martin from Coldplay at work. Strictly speaking, I shouldn’t have been taking photos, but I was standing behind non-performing band members, and couldn’t really resist. Most of the other photos have him gurning or are otherwise unlikely to be cleared by his PR, but they’re on Flickr nonetheless. Anyway, listen out for an interview with Christian on air from Monday, when you’ll also be able to watch the whole 30 minute set. It’ll also be available to view online.